You know how people forward you inspiring stories through email? I have a lot of friends, and I get my share of them. Sometimes I read them and sometimes I don't. I never forward them on. But this one caught my eye and I read it all the way through. It struck a chord, because it was about one of the many courageous MedEvac chopper pilots that I remember from my time in Vietnam. Back in 1969 I was an adviser to Vietnamese soldiers, and my team lived on the edge of a village. Our job was to train and encourage these soldiers to protect their village and the surrounding countryside from the Viet Cong. One night, the village and our bunker came under mortar attack. At one point, the villagers brought two badly wounded soldiers to us. One had a bullet wound near his collar bone. The other's body was covered with countless shrapnel wounds. We called for MedEvac. The 5th Mechanized Infantry Division's base camp was not far from us, and the chopper arrived ten minutes later. The village that night was what was known as a "hot LZ," but when the pilot saw our flare he came right in, landing his Huey at a crossroads in the village. It was a tough landing, because his rotor blades missed the surrounding buildings by only a few feet. We loaded the wounded and he lifted off. I was amazed at the pilot's skill and courage. These men performed similar acts of valor several times a day, mission after mission with little or no recognition. But I honored the pilot in my heart, and I've never forgotten these unsung heroes. You're a 19 year old kid. You're critically wounded and dying in the jungle somewhere in the Central Highlands of Viet Nam. It's November 11, 1967. LZ (landing zone) X-ray. Your unit is outnumbered 8-1 and the enemy fire is so intense, from 100 yards away, that your CO (commanding officer) has ordered the MedEvac helicopters to stop coming in. You're lying there, listening to the enemy machine guns and you know you're not getting out. Your family is half way around the world, 12,000 miles away, and you'll never see them again. As the world starts to fade in and out, you know this is the day. Then, over the machine gun noise, you faintly hear that sound of a helicopter. You look up to see a Huey coming in. But it doesn't seem real because there are no MedEvac markings on it. He's not MedEvac so it's not his job. But he heard the radio call and decided he's flying his Huey down into the machine gun fire anyway. Even after the MedEvacs were ordered not to come, he's coming anyway. And he drops it in and sits there in the machine gun fire, as they load 3 of you at a time on board. Then he flies you up and out through the gunfire to the doctors and nurses and safety. And, he kept coming back! 13 more times, until all the wounded were out. No one knew until the mission was over that Captain Freeman had been hit 4 times in the legs and left arm. 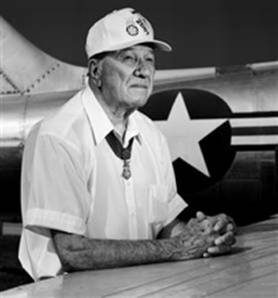 Medal of Honor recipient, Captain Ed Freeman, United States Air Force, died last Wednesday at the age of 80, in Boise, Idaho. May God bless and rest his soul. I bet you didn't hear about this hero's passing, but we've sure seen a whole bunch about Michael Jackson, Tiger Woods, Lindsay Lohan and the bickering of congress over health reform. Shame on the American media! Now ... YOU pass this along to YOUR mailing list. Honor this real American hero. Ed Freeman was not an urban legend. And his heroism was unsung until several years ago when President Bush awarded him the Medal of Honor. Whether you agree with the war or not, the young men and women who go and serve make a sacrifice that's hard for most people to comprehend. So the next time you see people in uniform, approach them and give them your sincere thanks for what they do. Thank you for sharing this story. Vietnam was a tragic chapter in our nation's history, but your post reminded us that it was not without its heroes. I am grateful to see stories like this, that not only illustrate what true heroism can be, but that help bring much needed honor to our veterans. May Captain Freeman's memory always be a blessing to his loved ones and fellow veterans. Thank you for posting this. What a great man. Thank you for this story, Dennis. I was married to a Marine Corp Lt. in 1965 - he was an advisor stationed at an outpost near Hue, and was pulled out by helicopter when the post was being taken over. When he came home we were stationed at Camp Pendleton. My roommate at Mary Washington College (near Quantico where they did Officers Training, thus a number of us married Marines) was married to a Helicopter Pilot. They were stationed at Pendleton at the same time we were, so we hung out with the Huey pilots. Almost all of them went back for 2nd and 3rd tours. It was a strange, crazy time -- many friends lost, not just to the war, but to the after effects of it. They went to serve their country and came home to be called baby killers. It took strong men to deal with all that was thrown at them in Vietnam and at home. It's nice to see one of them being honored. Thank you. A true hero, hopefully not an unsung one. Thanks so much for sharing, Denny. It brought tears to my eyes. Every American should be grateful! Major Freeman was not in the Air Force. He was an US Army pilot. Someone should write the story of the award of the CMH to Captain Freeman and Major Bruce Crandall who also received the Medal of Honor for the same missions. It is a case where fact is more interesting than fiction.